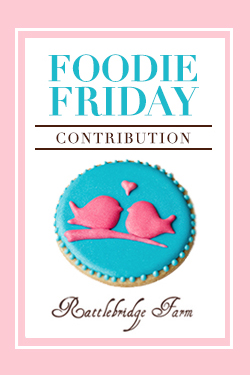 I love Valentine's Day goodies, I think mostly because my birthday is on Valentine's Day. As a kid, I always considered it "my" holiday. Every year on my birthday, I would have a heart-shaped cake in either strawberry or red velvet. 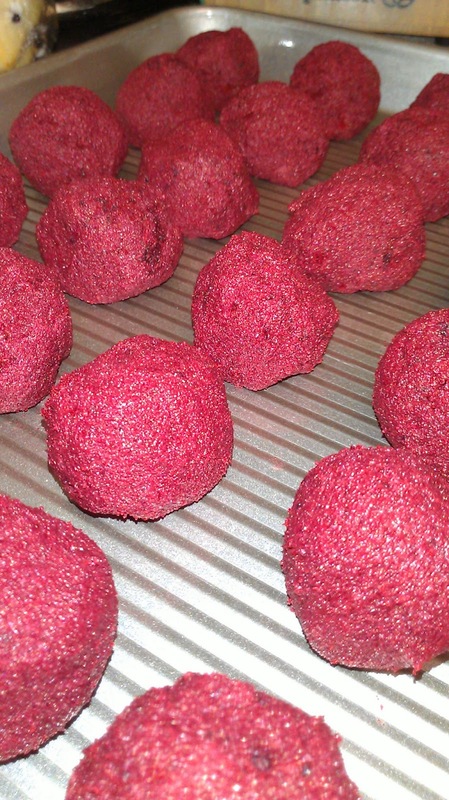 These red velvet cake balls take me back there a little. 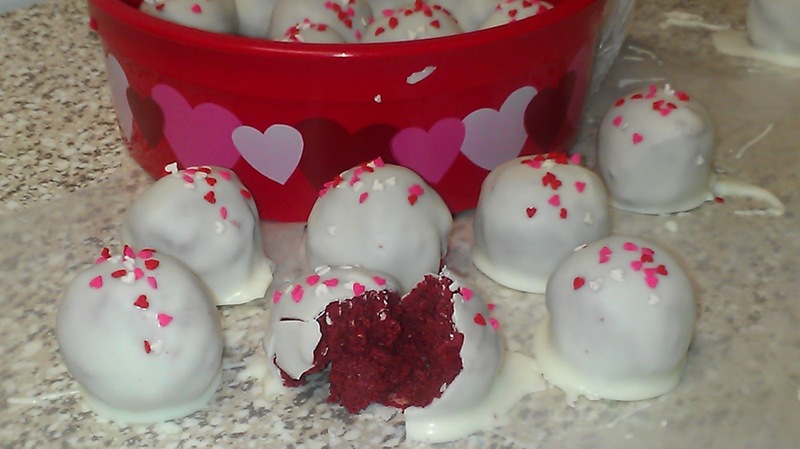 Cake balls and cake pops are becoming so popular right now that I almost didn't make this post. But then I heard someone talking about how difficult they thought it would be to make cake balls without the cake pop maker (basically a waffle-iron-type contraption). 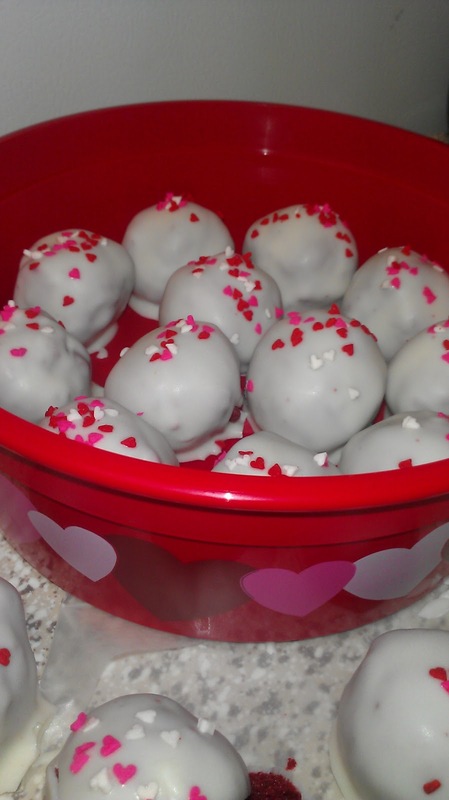 Cake balls are a super-simple treat that look fancy and can be changed up for any occasion. They don't take a lot of any special decorating skills, so I want to encourage people to try their hand at making them! Mix and bake the cake according to the package directions, and let cool completely. Next--and I know this is heartbreaking--take your perfect cake and rake through it with a fork. 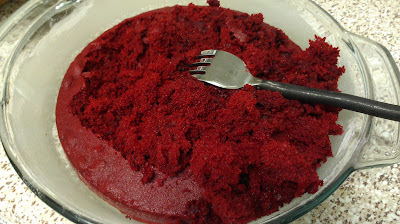 When your crumbs are all nice and fine, dump in the entire container of icing. Mix thoroughly. It gets a little tiresome to stir, but keep at it. 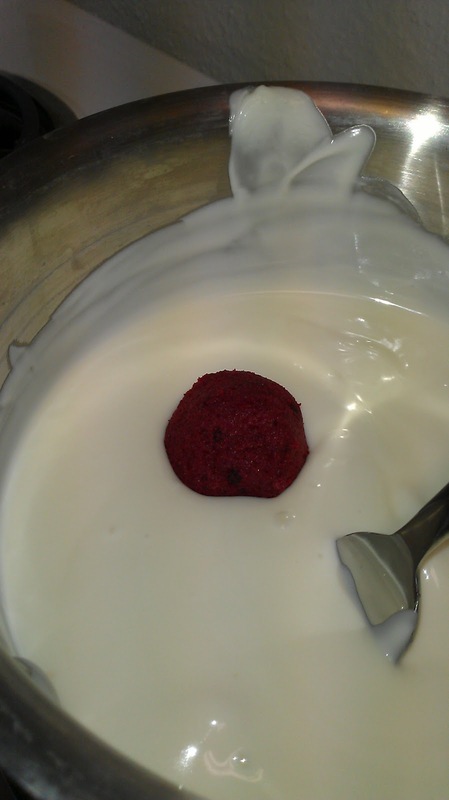 Using a big mixing spoon can help. You will be left with a thick dough. 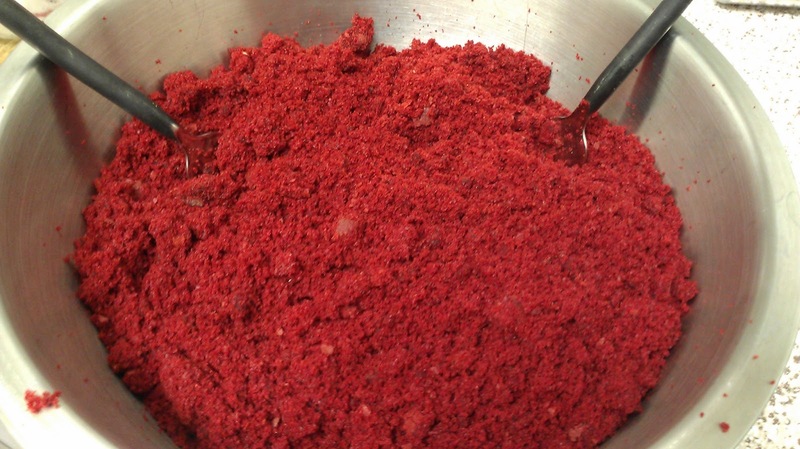 Using your hands, grab chunks of the dough and roll into balls. The size isn't super important, as long as they are fairly consistent. Mine were about meatball size--probably a couple of tablespoons each. Place on a plate or tray. At this point, I would recommend putting them in the fridge for an hour or two so they can chill and firm up a bit before you put the candy coating on them. If you are in more of a hurry, you can put them in the freezer for 15 minutes or so. I actually left mine in the fridge overnight, because I didn't have time to finish them all that evening, and they were fine. 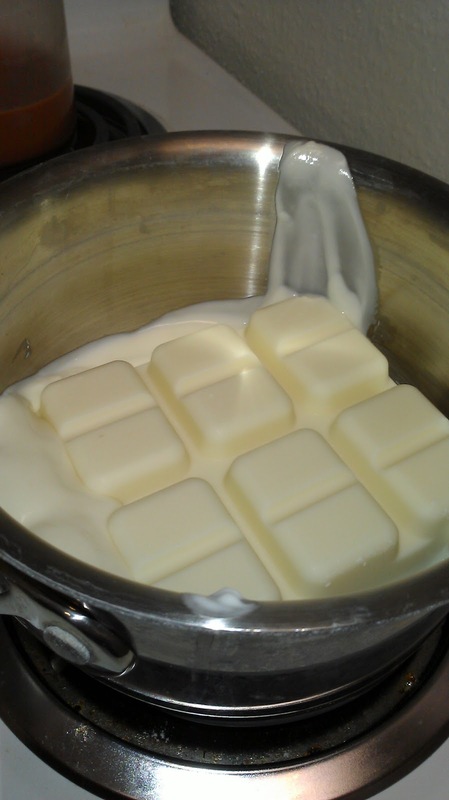 Melt your candy coating either in the microwave or on the stove on low heat. 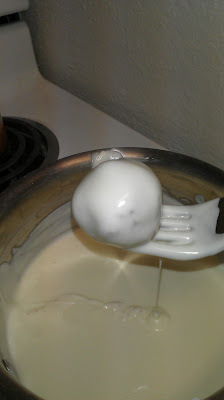 Gently stir the cake ball into the coating, or use a spoon to pour the coating over the top. 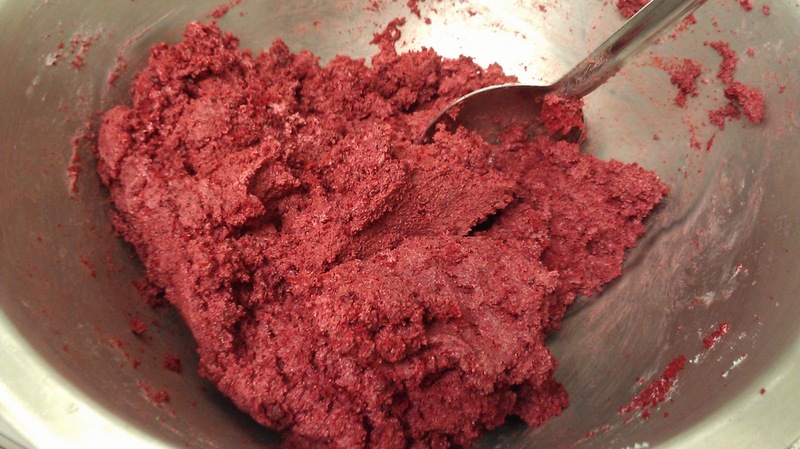 When the entire cake ball is covered with candy coating, lift out with a fork, letting excess coating drain off. 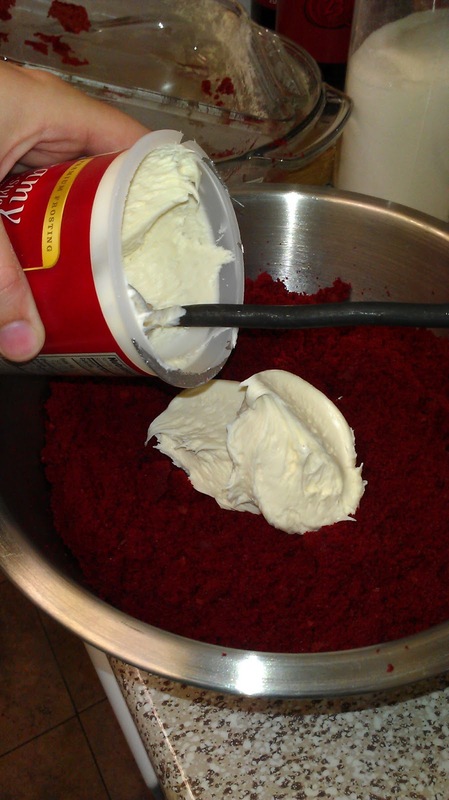 Immediately add a few sprinkles to the top. Don't wait and sprinkle several together, or your coating will have hardened enough that the sprinkles will not stick well. 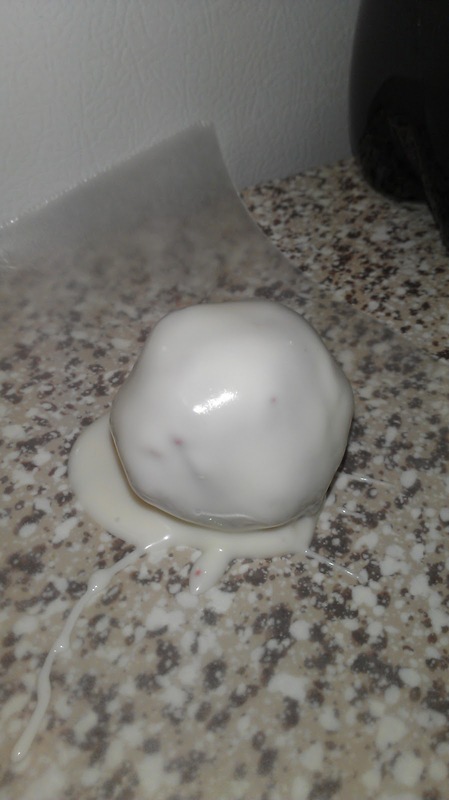 Continue with the rest of the cake balls, or until you run out of coating. My cake make 45 cake balls, but I only had enough coating for 38 when using just one package. Let the cake balls sit until the coating is completely hardened. 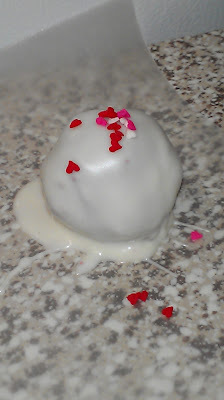 Once this happens, the cake balls are very sturdy and will travel well. I packaged up a dozen for my secret pal in a Valentine's container. I just love how festive and fancy these are! Although I used icing here, as is traditional, my favorite way to make cake balls is by using softened cream cheese instead of icing. Talk about delicious! The only drawback is that they have to be refrigerated, which doesn't work as well for transporting and gifting. Don't be afraid to try all different flavors of cake with either chocolate or vanilla coating! 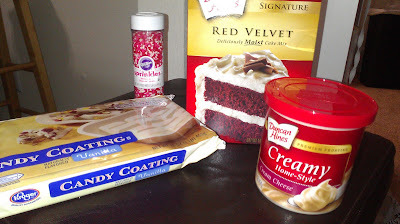 Don't be afraid to try all different types of icing! Be creative! I decided one Halloween that I wanted orange cake balls with dark chocolate coating. I started with a white cake and used cream cheese instead of icing. To get the orange color and flavor I wanted, I mixed a packet of orange Kool-Aid powder with an 8 oz block of cream cheese. 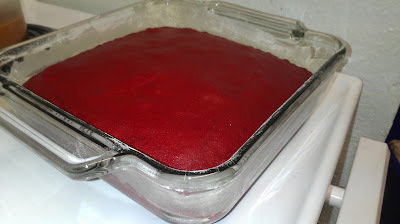 (If I remember right, I also added a little sugar to cut down on the tartness of the straight powder). The result was delicious, a little reminiscent of a chocolate orange. So many awesome flavors could be made this way! Cake balls don't have to be perfect. Part of their charm is that they are not completely uniform, because it shows they are handmade. If you smudge some of the coating off while transferring a cake ball from pan to waxed paper, don't worry about it. Take a small spoonful of coating and drizzle it over the messed-up part. It will dry with the rest and no one will be the wiser. If you realize later you missed a spot, it's no biggie. People will be too busy consuming your delicious creations to notice, anyway. 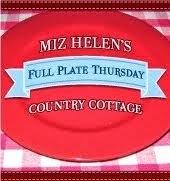 Linking up with Rattlebridge Farm for Foodie Friday and Miz Helen's Country Cottage for Full Plate Thursday! 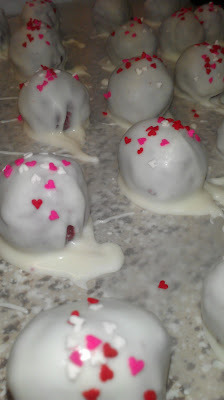 Your Valentine Cake Balls look like a great treat for Valentines Day! Thank you so much for sharing with Full Plate Thursday and have a great week!